Meadows Mills, Inc. of North Wilkesboro, NC is proud to unveil its new website, created by LumbermenOnline.com, the sister company of Lumbermen’s Equipment Digest. The transition to the new website allows Meadows’ customers to browse the same equipment and information clearly with the mobile friendly design that adjusts to the users’ device. With the wide range of high quality, low cost equipment Meadows is known for, easy navigation and grouping of products such as carriages, edgers, and material handling equipment was overdue. Nearly 120 years of history and the ever-changing demands of innovation are wrapped up in every Meadows’ product – incorporating both in the website was essential. 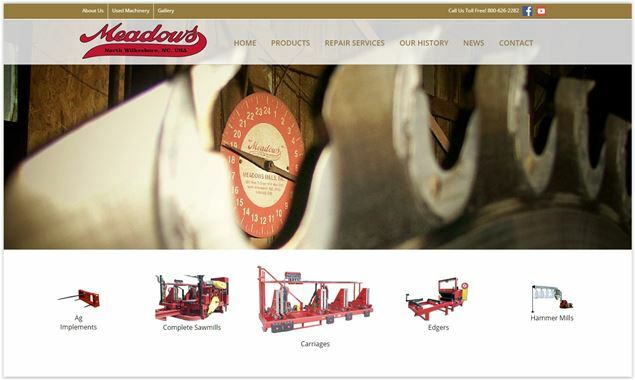 Many company history pages reference a generation or two, Meadows Mills’ begins in 1900 and covers multiple owners, acquisitions and how they’ve produced over 50,000 machines with its detailed navigation back in time. Whether you’re in the market for new equipment or not, it’s a must read. Visit the new MeadowsMills.com, and you’ll be able to easily browse their entire sawmill equipment line up, check out their stone burr mill equipment, and find information on their new ag implements. The next time you’re upgrading, replacing or building a complete new system, start your search by going to MeadowsMills.com!